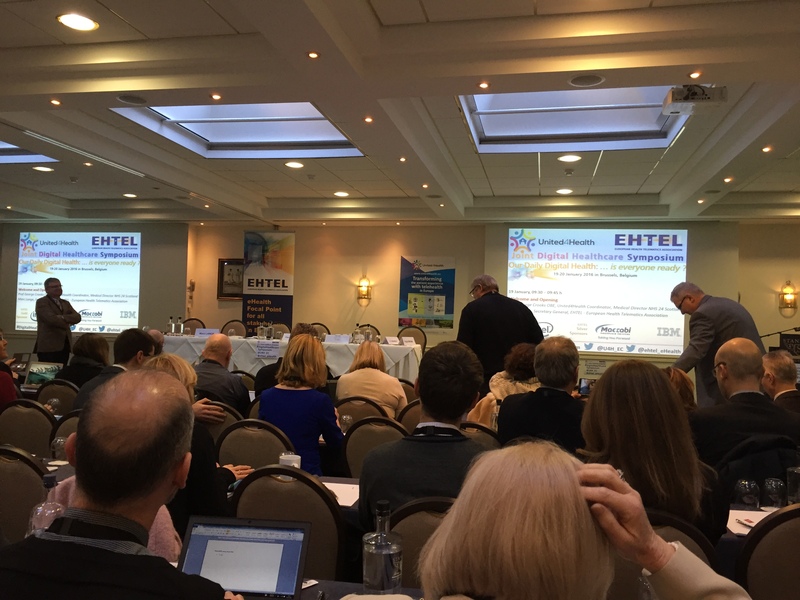 On 19th and 20th January, United4Health and the European Health Telematics Association (EHTEL) co-organized a ‘Joint Digital Healthcare Symposium’ with a subtitle: ‘Our Digital Health: … is everyone ready?’. The event took place at the Stanhope Hotel in Brussels, Belgium. The Joint Digital Healthcare Symposium convened the Thought Leading European eHealth community to join the collocation of the United4Health Final Conference and the 7th Annual EHTEL eHealth Symposium. European Healthcare systems are at a crossroads. Balancing cost, accessibility and quality of healthcare seems to be an impossible equation. Stakeholders from the field will present lessons learned on what it really means to use eHealth and mHealth at scale to transform healthcare delivery. Learn about the headline lessons learned and outcomes from the evaluation of the large scale European telehealth deployment project United4Health. A look forward into the future of healthcare transformation. Given earlier Alert Levels in Brussels most of the Joint Digital Healthcare Symposium tooks place between 19-20 January 2016 (9:30 – 18:00 / 9:30 – 14:00). However the affiliated workshop “eHealth in Europe: reality and challenges ahead” during which doers from the field have informed policy makers of what it really means to use eHealth and mHealth at scale to transform healthcare delivery in the European Parliament on 1 December 2015 was maintained and took place on 1 December 2015 at the European Parliament in Brussels. See the report from the workshop here.